The ‘560 patent describes a method used in video game for a character to attach itself to a target. The player can move his character toward an object and then selects that object. The game computes the values of the object and determines whether or not the object is available to be picked up. If the object is determined to be available, the character acquires the object and the item is either held or placed into storage. If the item cannot be picked up, a notification is given to the character that the object is unattainable. 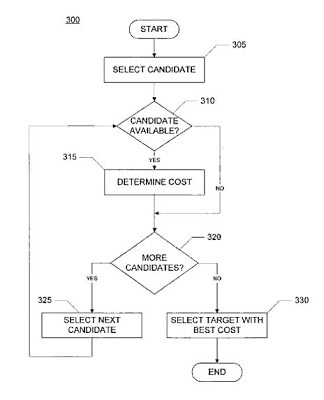 Methods and apparatus for selection of a target for attachment. In one implementation, a method of selecting a target for attachment by a moving character in a video game, wherein the character has a position and a velocity, includes: selecting one of a plurality of attachable objects as a candidate object, wherein each attachable object is of an object type from among one or more object types; determining if the candidate object is available according to the current position of the character and the object type of the candidate object; and if the candidate object is available, determining a cost for the candidate object according to the position and velocity of the character and the object type of the candidate object, wherein the cost represents an acceleration to attach the character to the candidate object. 1. A method of selecting a target for attachment by a moving character in a video game, wherein the character has a position and a velocity, the method comprising: selecting one of a plurality of attachable objects as a candidate object, wherein each attachable object is of an object type from among one or more object types; determining if the candidate object is available according to the current position of the character and the object type of the candidate object; and if the candidate object is available, determining a cost for the candidate object according to the position and velocity of the character and the object type of the candidate object, wherein the cost represents an acceleration to attach the character to the candidate object.